WRBH Reading Radio is happy to announce that we have invited the New Orleans-based start-up SaintsforSinners to help participate in a special ongoing fundraising effort for our radio station. SaintsforSinners offers imported Italian saint medallions, all of which are one-of-a-kind and hand painted here in New Orleans. 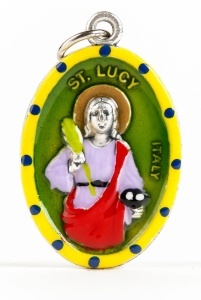 One of their popular medals is a rendition of Saint Lucia, or “Lucy,” who is often invoked to help people dealing with eyesight and vision issues. WRBH is now selling a special hand-painted Saint Lucy medal package for $30.00 with 100% of the money going directly to WRBH Reading Radio. Local lawyer Rob Clemenz is the creator and founder of SaintsforSinners, a company he began in an effort to help others find comfort through reading about the lives of old age saints and their inspirational stories. His medals are worn by people of all religious denominations, including scores of national and local musicians, actors, comedians, and celebrity chefs, many of whom are featured on the www.SaintsforSinners.com. WRBH would like to thank Rob and SaintsforSinners for working with us to help raise needed funds. We would also like to extend a special thanks to local photographer Zander White for providing the image of Saint Lucy that is now featured on our website. You can learn more about Zander and his photography by visiting www.ZanderWhite.net. For more information about SaintsforSinners, please visit their website at www.SaintsforSinners.com.